Situated about 3.5 hours drive West of Melbourne, at the foothills of the Grampians is the town of Tarrington, formerly known by the name given to it by its German settlers, Hochkirch. A mere 70km north of the cold Southern coast of Western Victoria this Western neck of the Henty GI sees gently undulating hills, cold breezes and the perfect conditions for cool climate farming. A late January morning can be as cold as 10oC until after breakfast! 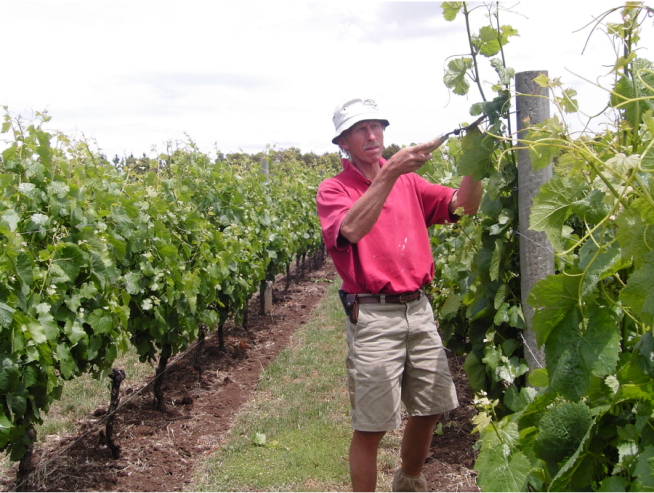 John & Jennifer Nagorcka’s family vineyard (20 acres) is part of a greater farm (700 acres), all simply named Hochkirch. The vineyard is close planted at around 5,000 vines/Ha on a North facing slope at 250m above sea level. The soil structure is red/brown basalt loam over granite & clay. All vines are on their own rootstocks. The Nagorckas co-own and manage John’s sister, Dianne Nagorcka’s younger vineyard, three kilometres down the road. The soil, aspect, climate and elevation are essentially identical, however the difference in the character of fruit is striking; an argument for the subtleties of terroir! The fruit from the home vineyard is bottled as Hochkirch Wines and the neighbouring vineyard under the Tarrington Vineyards label. These two sites are farmed with an eager commitment to biodynamics that has shown considerable rewards. They produce exceptionally vibrant fruit, both processed fearlessly without additions for their respective labels by John and his family at their winery located at the Hochkirch farm. The Hochkirch wines are priced according to the quality of each vintage. Pinot Noir ranges from $18 LUC to $28 depending on vintage. Likewise, the dryness of the Riesling varies according to harvest. The quality style & integrity remain consistent year on year, making these labels exciting, engaging and a carry a refreshing sense of focus on the farm, not the winery.